Not to be confused with Eastern Ranges, Eastern Range mine, or Great Eastern Ranges. Launches of captured German V-2 rockets had been ongoing since the end of World War II at White Sands Proving Grounds in New Mexico, but it became clear that a much longer range away from heavily populated areas would be needed. The Joint Research and Development Board established the Committee on the Long Range Proving Ground in October 1946 to study locations for such a range, with three potential sites emerging: along the northern coast of Washington with a range along the Aleutian Islands; El Centro, California, with a range along the Baja peninsula; and Banana River Naval Air Station with a launch site at Cape Canaveral and a range over the Bahamas and into the Atlantic Ocean. The Washington site was quickly discarded due to difficulties with support due to cold weather and remoteness. El Centro was put forth as the primary choice (due to being close to missile manufacturers) with the Cape as second choice. However, the El Centro site had to be abandoned after a wayward V-2 missile from White Sands crashed into a cemetery in Juarez, Mexico, leading to then Mexican President Miguel Alemán Valdés refusing to allow missiles to overfly Baja. The Navy transferred the Air Station to the Air Force on September 1, 1948, and it remained on standby status. On May 11, 1949, President Truman signed Public Law 60 which established the Joint Long Range Proving Ground. On June 10, 1949, the Banana River Naval Air Station was redesignated the Joint Long Range Proving Ground Base and Advance Headquarters, Joint Long Range Proving Ground and the Air Force Division, Joint Long Range Proving Ground was established. On May 16, 1950 and May 17, 1950, range and base dropped the "Joint" in their names due to a DOD decision earlier in the year to put the range exclusively under Air Force jurisdiction. On July 24, 1950, Bumper #8 became the first missile to launch from the Cape. The Long Range Proving Ground Base was renamed Patrick Air Force Base on August 1, 1950, in honor of Major General Mason M. Patrick and the following year, on June 30, 1951, the Joint Long Range Proving Ground Division became the Air Force Missile Test Center and the Joint Long Range Proving Ground became the Florida Missile Test Range. These would not be the only name changes for the range or the agency that controlled it. The Florida Missile Test Range was renamed the Atlantic Missile Range in 1958 and the Eastern Test Range in 1964; the Air Force Missile Test Center was redesignated the Air Force Eastern Test Range (AFETR) in 1964, then control of the range was transferred to Detachment 1 of the Space and Missile Test Center located at Vandenberg Air Force Base when AFETR was deactivated on February 1, 1977, which put both the Eastern and Western ranges under the same leadership. On October 1, 1979, control of the range passed to the newly activated Eastern Space and Missile Center (ESMC). The ESMC was transferred from Air Force Systems Command to Air Force Space Command on October 10, 1990; finally, on November 12, 1991, the 45th Space Wing was activated and assumed operational control for the range from ESMC; on the same day the Eastern Test Range became the Eastern Range. :5 The transition on the west coast occurred one week later on November 19, 1991, when the Western Space and Missile Center became the 30th Space Wing and the Western Test Range became the Western Range. In 2014, Raytheon won a contract to operate the Western and Eastern ranges for the next 10 years through their subsidiary Range Generation Next. In February 2017, SpaceX's CRS-10 launch was the "first operational use" of the Autonomous Flight Safety System (AFSS) on "either of Air Force Space Command's Eastern or Western Ranges." The following SpaceX flight, EchoStar 23 in March, was the last SpaceX launch utilizing the historic system of ground radars, tracking computers, and personnel in launch bunkers that had been used for over sixty years for all launches from the Eastern Range. For all future SpaceX launches, AFSS has replaced "the ground-based mission flight control personnel and equipment with on-board Positioning, Navigation and Timing sources and decision logic. The benefits of AFSS include increased public safety, reduced reliance on range infrastructure, reduced range spacelift cost, increased schedule predictability and availability, operational flexibility, and launch slot flexibility." The range consists of a chain of shore and sea-based tracking sites. "By January 1960, the Eastern Range included 13 major stations, approximately 91 outlying sites, a fleet of ships and three marine support stations. By September 1963, the Eastern Range extended around the tip of South Africa to the island of Mahé in the Indian Ocean." Much the sea-based tracking and many of the land based stations have been replaced by space based tracking, including the present TDRSS. ^ a b c d e f g h "Section 1.0, Eastern Range, General Range Capabilities" (PDF). 45th Space Wing/Patrick Air Force Base, Launch Site Safety Assessment (Report). Federal Aviation Administration. Research Triangle Institute, Center for Aerospace Technology. March 1999. RTI/6462/219-01F. ^ "National Security Space Road Map: Eastern Range (U)". U.S. Air Force. July 12, 1999. Retrieved February 10, 2008. ^ "45th Space Wing/Patrick Air Force Base Launch Site Safety Assessment". National Technical Reports Library. Federal Aviation Administration. June 8, 2002. pp. 1–8. RTI/08087.002/TASK 1.2-06.0F. ^ a b c d e f g h i j k l m n o "Fact Sheet: Evolution of the 45th Space Wing". U.S. Air Force. August 29, 2006. Archived from the original on June 13, 2011. Retrieved June 2, 2008. ^ a b c d e f g h i Lethbridge, Keith (2000). "Chapter 2: The Missile Range Takes Shape (1949-1958)". The History of Cape Canaveral. Spaceline.org (Report). Retrieved February 24, 2008. ^ a b c d e f g Hanna III, George V. (October 1965). "Chronology of work stoppages and related events, KSC NASA and AFETR, through July 1965" (PDF). NASA/Kennedy Space Center. NASA-TM-X-60558. ^ a b c d e Lethbridge, Keith (2000). "Chapter 3: NASA Arrives (1959-Present)". The History of Cape Canaveral. Spaceline.org (Report). Retrieved August 23, 2009. ^ 30th Space Wing Public Affairs. "Fact Sheet: History Office". U.S. Air Force. Archived from the original on December 14, 2008. Retrieved August 24, 2008. ^ "Vandenberg AFB". Titan-II.com. Archived from the original on August 20, 2008. Retrieved August 24, 2008. ^ Gruss, Mike (November 6, 2014). "Raytheon Team Wins $2 Billion Air Force Range Support Contract". SpaceNews. Retrieved January 25, 2018. ^ Messier, Doug (February 26, 2017). "Air Force Eastern Range Innovates With Autonomous Flight Safety System". Parabolic Arc. Retrieved March 20, 2017. ^ a b "45th SW supports SpaceX's CRS-10 launch". United States Air Force. 45th Space Wing Public Affairs. February 19, 2017. Retrieved March 16, 2017. ^ "45th SW supports successful Falcon 9 EchoStar XXIII launch". United States Air Force. 45th Space Wing Public Affairs. March 16, 2017. Retrieved March 20, 2017. ^ Gebhardt, Chris (March 20, 2017). "Air Force reveals plan for up to 48 launches per year from Cape Canaveral". NASASpaceflight.com. Retrieved March 30, 2017. ^ a b Parker, Loyd C.; Watson, Jerry D.; Stephenson, James F. (July 1989). Baseline Assessment, Western Space and Missile Center (PDF) (Report). U.S. Department of Transportation. Research Triangle Institute, Center for Systems Engineering. RTI/4028/01-02F. ^ a b "Fact Sheet: Development of the 45SW Eastern Range". U.S. Air Force. Archived from the original on August 25, 2010. Retrieved January 12, 2008. ^ McCusker, Joseph (2004). "Contractor operated USAF air bases". Airforcebase.net. 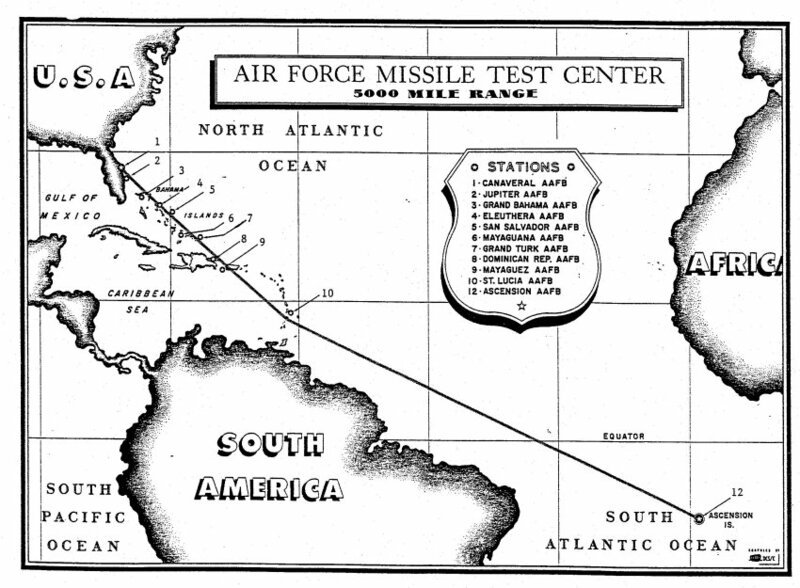 ^ "Air Force Missile Test Center (historical map)". U.S. Air Force. October 1957. Archived from the original on September 27, 2011. ^ Thompson, Tabatha; Diller, George (July 6, 2007). "Dawn Launch Moves to No Earlier Than Monday July 9". NASA. NASA M07-083. Gruss, Mike (April 6, 2015). "Raytheon Team Wins $2 Billion Air Force Range Support Contract". SpaceNews. Retrieved April 8, 2015. "2007 NASA Range Safety Annual Report" (PDF). NASA. 2007. This page was last edited on 12 April 2019, at 08:54 (UTC).